The Logitech UE Boom has a lot to offer, but great sound isn't part of the deal. The features are good and so is the battery life, but the sound is below average. 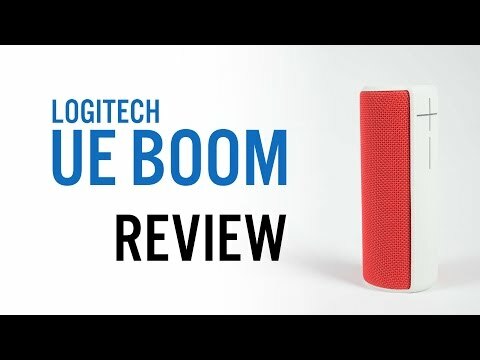 The Logitech UE BOOM has been out for quite a while, and we haven’t yet reviewed it here at Sound Guys. Funny enough, there’s a story behind that. We first got it in quite a few months ago and I took it out of the box, gave it a quick test, and was so unimpressed that I passed over it in favor of much more exciting stuff that was coming out at the time. Then I pretty much forgot about it. Over the following months, we’ve had a good amount of requests to review the UE BOOM, and while we took note of them, there were generally more interesting things to review. That said, the requests didn’t stop coming. So here, finally, is our review of the Logitech UE BOOM. Don’t say I didn’t warn you. In a fun twist, the box is cylindrical, just like the speaker. Open it up and you’ll find everything tucked inside a piece of plastic that is either a lightweight carrying case or overly-sturdy packaging. Inside you’ll find the speaker, USB wall charger, a micro USB cable, and the manual. This isn’t the first cylindrical speaker we’ve looked at. Early after the launch of Sound Guys, we took a look at the JBL Flip 2 and quite liked it. While the speakers are obviously quite similar in shape and size, the UE BOOM is the flashier looking of the two. Part of this is the sheer amount of colors it comes in: Red, White, Aqua, Blue Steel, Citrus and Night Blue represent only roughly half of the options available. The UE BOOM is on the upper side of portable, measuring just over 7 inches tall and weighing in at 19 oz. It’s basically the size of a large beer can, and if you’ve ever tried to fit one of those in your pocket, you’ll know that isn’t an easy option here. Still, it should fit in a backpack easily. Logitech claims that the skin is coated, giving it water and stain resistance, though as far as we can tell, it hasn’t received any sort of certification. It feels like it’s been quite a while since we’ve reviewed a speaker that features NFC pairing, but the UE BOOM does. This is the easiest option, though if your device doesn’t feature NFC, pairing is as simple as holding down the Bluetooth button on top of the speaker until it enters pairing mode, then pairing from your device. A 3.5 mm aux jack provides connectivity for other devices. Logitech claims a range of 50 feet, which is around 15-20 more than we usually see claimed. In our testing the speaker worked fine at around 35 to 40 feet, but the connection got spotty anywhere beyond that. In a nice touch, Logitech allows you to pair two separate UE BOOMs for stereo sound using the UE BOOM app. The app also allows you to change the EQ using either presets or a 5 band equalizer. Looking at the buttons, you get a total of four: the power and Bluetooth buttons are on top, while you’ll find the + and – buttons on the side. These only control volume, and can’t be used to skip tracks. No playback controls are present. Logitech claims up to 15 hours of play time for the UE Boom, which is impressive. In our testing, we consistently got closer to 11, which is pretty far off from the claim, but still good nonetheless. Battery life can be checked either by using the UE BOOM app or by holding the + and – buttons down. Charge time was roughly 2.5 hours using the included charger. While wired headphones are usually tested with the best signal possible, when it comes to wireless devices we do the majority of testing in the manner the speaker will be used most of the time. In this case it means Bluetooth, though we did try the 3.5 mm jack during testing as well. Logitech is honest, stating the UE BOOM’s range as 90 Hz to 20 kHz instead of claiming more range than is possible in this size. That honestly doesn’t help when it comes to the lows though, which are simultaneously weak and muddy. Lower mids are on the boxy side, adding a touch of cardboard to guitars. Higher mids are a bit better, but not much. Snare drums sound uniformly weak and higher guitar notes sound thin. On most material the highs are tinny and harsh, though they don’t hide details. Cymbal bells cut through nicely. One thing the UE BOOM does well is telegraphed by it’s name: it gets loud. This speaker pumps out much more volume than many speakers its size, though I found something about the sound to be fatiguing, even at lower volumes. The Logitech UE BOOM does a lot of things right. The battery life is decent, 360 sound is a plus, and it has got a ton of extra features. Unfortunately, the sound just doesn’t hold up to many other speakers out there, especially for the price. If you’re in the market for a speaker this size, it’s worth your time to check out our review of the JBL Flip 2. It doesn’t have the best battery life, and it’s missing the admittedly cool stereo link feature the UE BOOM has, but it will only cost you $99 and it sounds much better.